A huge shout-out to all my fellow sisters who have super oily skin like mine and hate watching their beautifully done makeup melt like a bad case of ice-cream meltdown. Another huge problem with oily skin is that you need multiple touch-ups to make that flawless look fresh all day. So basically, for us, oily-skinned humans, perfectly put makeup is a far-fetched reality and literally a lot of work! But fret not ladies, I’ve got the solution to your woes. Don’t worry about them not working. I have personally tried and tested them all. Just follow these few simple makeup tips for oily skin, and you will be looking glam-glam all day long! Rule no. 1: Skincare regime. Always always always follow your skin-care regime before you start your makeup. By skin-care regime, I mean the Cleanser, Toner, and Moisturizer, more commonly known as CTM that balances out the sebum secretion of your skin. Invest in these products even though you might not see their importance now. They will go a long way to better your skin in the future. And remember ladies, if your skin isn’t naturally healthy, no amount of make-up is ever going to give you that radiant look. So, always take care of your actual skin first. This is actually an essential rule to keep your makeup in place. Omitting this step will mean a very bleak future for your makeup. So, remember to use a mattifying primer to prep your skin for the makeup. A primer not only helps your makeup to last long but also settles all the inconsistencies of your skin. 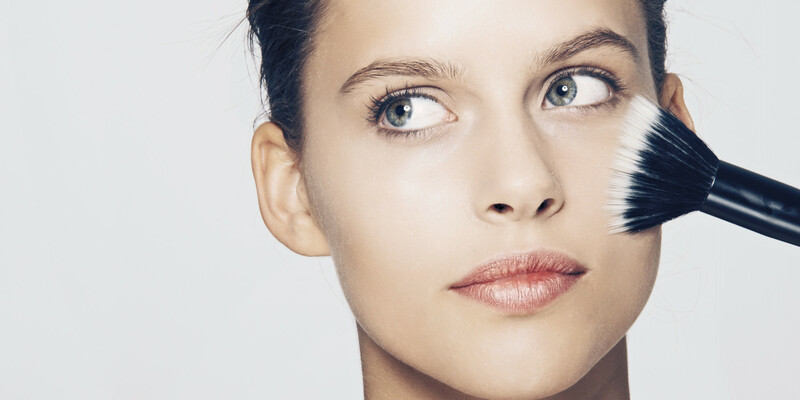 Especially if your skin is acne-prone, a primer is your best bet. It saves your skin from more breakouts and helps to give you a proper coverage. The primer also controls the oil secretion, so that you don’t look like a melting butterface and only that healthy glow is evident. For eye makeup, there are special eye primers too. Oftentimes, the makeup looks weird only because you chose the wrong kind of foundation or the wrong shade of it. For those of you who are neophytes in the makeup segment, there are quite a few kinds of foundations available in the market. The liquid ones, cream-based, powder based and mousse foundations to name a few. Out of these, powder or mousse foundations are the ones you should be looking for, as they will mattify your makeup a bit so that the skin doesn’t look too shiny by the end of the day. The cream-based and liquid ones are a big no-no as they will only make your skin over moisturized and your makeup extra shiny. Also, remember to use non-comedogenic products, as otherwise, they lead to blackheads and whiteheads which would then result in massive break-outs. After applying your foundation, apply a thin sheet of translucent powder with a large fluffy brush so as to lock your makeup in its place. I promise it won’t move an inch all day. However, remember to not go overboard with the powder. Otherwise, it will only give you a cakey look and won’t do your makeup much good. So just lightly brush it off of your face with a good fluffy brush in circular motions so that both of your bases merge well. There’s also a small trick that I learned from my mom which has worked wonders for my makeup. It is to rub ice over the face before priming and putting makeup, as it helps to control oil and reducing the pore-size considerably for that even skin. To stop the makeup from oxidizing, use a makeup fixing spray. Oxidizing means that your foundation becomes a few shades darker a few hours after coming in contact with the sun, leading to a darker and duller look. The fixing mist will not only help your makeup stay put but will also give that quintessential finishing touch to your makeup for a dewy fresh look. Trust me, you’re going to love this one. These sprays are available in all sorts of price ranges. So, don’t worry about them digging deep into your wallets. And at times when you just want your face to look fresh even without any makeup, you could always just spray a little of this product. You will be glowing, as most of these sprays are chemical free, only containing good minerals for the skin. If even after all this, your skin is too stubborn or the sun is too high, certain areas of your face could become shiny and you don’t want that. So, to keep that oil at bay and for your base makeup to stay longer, keep some blotting sheets handy. Don’t make the mistake of using tissues instead. They will just lighten your makeup. Instead, blotting sheets only take the oil away, while the pigment of your foundation stays fresh and put. Lastly. don’t forget to stay hydrated and to smile. There isn’t any makeup in the world that makes you look beautiful the way these two can. So, let me know if these makeup tips for oily skin helped or if you have suggestions for any upcoming posts by commenting below.